Hello Vivien!! 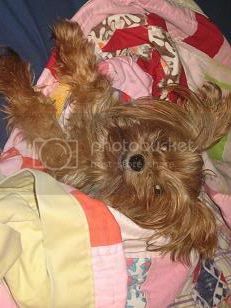 She's so cute---all comfy and ready for a cuddle. Yup, this is Vivien lounging on an air mattress that I recently had out when I had some guests at my apartment. Vivien loves the air mattress (and it's a miracle that it can stand up to her claws and enthusiasm... but so far so good). What's his name? He is very cute--looks likes Jake's "Boo". Is he laid back mostly? 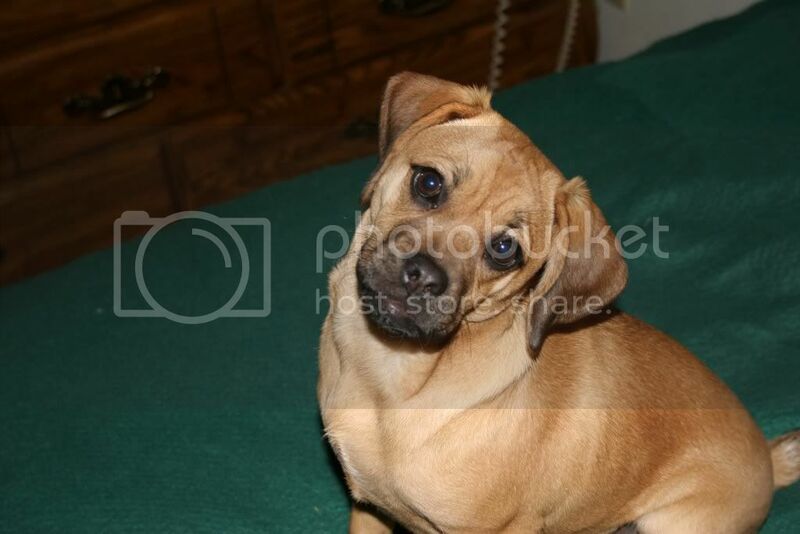 I wondered what kind of personality a puggle has. I've had a beagle before, but no pugs. This is my little scruffy snuggle-buddy. Her name is Nicki and she is a constant companion. She'll be 8 in September. I woke her up to take her picture---she doesn't mind, tho. She's cool. Actually, she is a spayed (as of Jan 07) little girl. Her name is Gertie. where I live, so we go to visit her a lot on our evening walks; and she comes and visits us also. She is very active, as most puppies are. Likes to chew up anything in sight. Just today, she destroyed on of the solar powered lights on my deck. But she does chew on her toys if they are available. 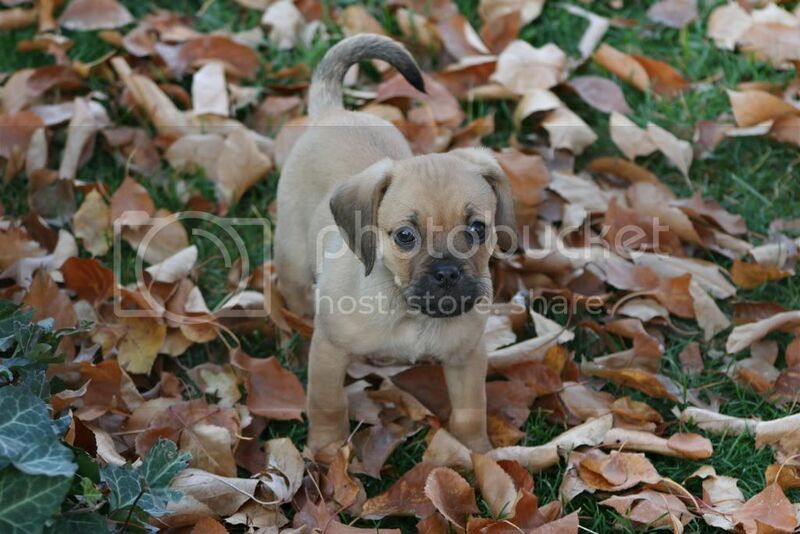 A Puggle is the mating of a Beagle and a Pug. 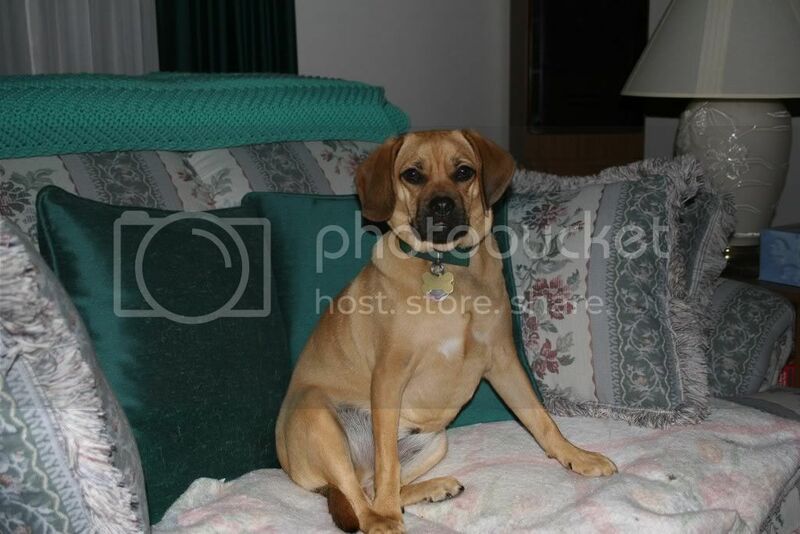 Gertie is a first generation mating between a purebred Beagle female, and a purebread Pug male. the ears have a tendency to not work! She is very affectionate, and loves to cuddle. She sleeps with me every night. What an irresistible little face!!! Bilingual---that's funny! I love to hear a beagle howling. I understand about the chewing. OMG--I have been through 2 vertical blinds on my sliding glass door, and several of my kitchen cabinets have been chewed up along with some door facings and a table and chairs. And they had PLENTY of toys!! I'm glad your deck light was solar powered and not electric!! One of my dogs chewed up a fan cord (it was totally in half) that was plugged in. I have no idea how he kept from getting zapped. Anyway--with that face of Gertie's I'm sure it's hard to stay mad at her! Vivien looks like she has a bit of Siamese in her somewhere! Thanks, ATZ!! She's a really good little dog. She goes to the bank, grocery store, Sonic, --- anywhere I go in town -- and hangs her head out the car window like a hound dog while she rides.